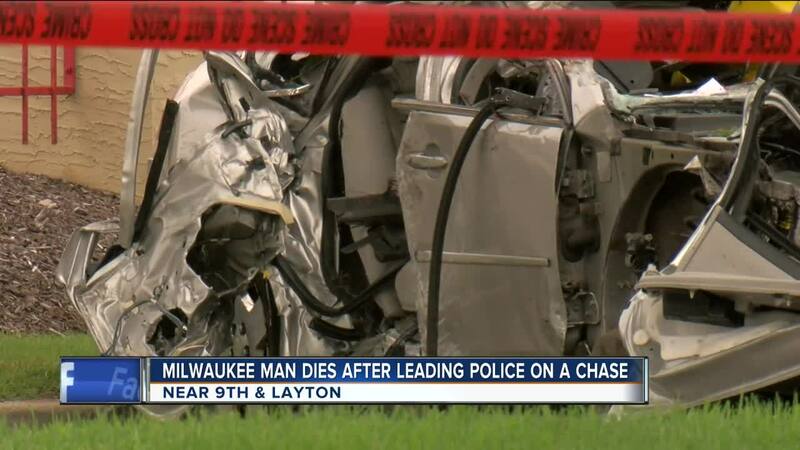 MILWAUKEE – What started as an early morning police pursuit in Greenfield ended in a deadly crash on Milwaukee's south side. “It’s unreal because when I came this way I actually saw the person laying in the road," Gina Harris said. The person Gina Harris is referring to is the 30-year-old driver of a now mangled silver car. “I have goosebumps everywhere," Harris continued. "Standing here, I have goosebumps because I know it’s behind me." The early morning crash shut down blocks of 9th St. and Layton Ave. for hours prohibiting Harris and dozens of others from making it to work on time. “At first I didn’t know what it was and then I looked and I’m like ‘oh, my god, that’s like actually a person. A headless person,'" Harris exclaimed. According to Milwaukee Police, the incident started with a traffic stop at W. Loomis Rd. and W. Layton Ave. at 3:15 a.m. Greenfield Police Officers tried to pull over a Milwaukee man for a traffic violation, but as officers got out of their squads and approached the stopped vehicle, the suspect drove away eastbound on Layton Ave. leading police on a chase. Greenfield Police stopped chasing the driver because of the danger of his high speed. Minutes later, the driver hit a semi. Police said the initial impact was at 10th St. and Layton Ave., but the car ended at 9th St. and Layton Ave. where Milwaukee Police spent the morning assisting. The driver died at the scene. Gina Harris said with Milwaukee leaders currently discussing police pursuit policies this crash highlights the dangers of reckless driving. “Unfortunately, all these people are dying from these chases," Harris lamented. "Innocent people too are getting hit by cars that are running from police. Maybe they need to change some type of chasing people rule or something," she continued. According to police, this crash is still under investigation.